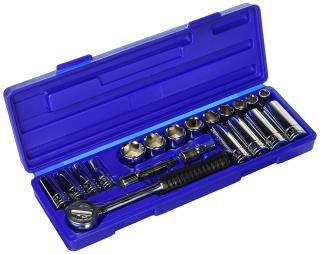 "Socket wrench set 3/8 inch drive 21 pc." has been added to your cart. 9-pieces 3/8" drive 6-point socket sizes: 3/8", 7/16", 1/2", 9/16", 5/8", 11/16", 3/4", 13/16", 7/8"
8-pieces 3/8" drive 6-point deep well sockets: 3/8", 7/16", 1/2", 9/16", 5/8", 11/16", 3/4", 13/16"